Moving image arrived on the scene in a maelstrom of electrical, chemical and mechanical innovation as the 19th century met the 20th. Artists and scientists responded in many ways, combining image, sound and then colour before those things were easy to do. 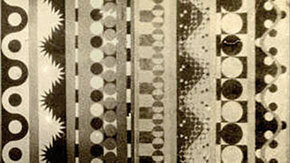 In the 1920s when it became possible to record sound as an image there was a flurry of bold, beautiful and sometimes bizarre experiments with ‘drawn’ soundtracks on film – images that made sound, and vice versa. This special programme includes a great range of fascinating exploratory pieces from Walter Gibbons, Hans Richter, Rudolph Pfenninger, Fernand Léger and Norman McLaren, plus more recent optical sound examples by Guy Sherwin, Lis Rhodes and David Leister.